I’ve been to Japan more times than I can remember, and I can say confidently that Kyoto is now my favorite city! 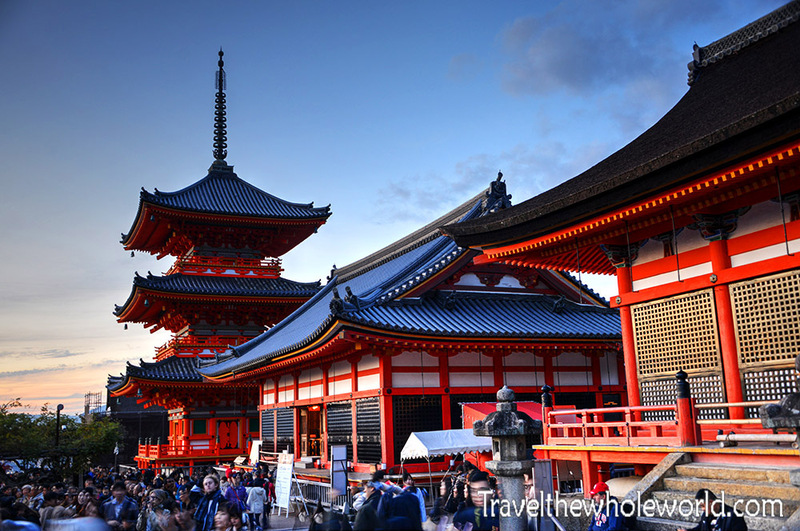 Kyoto was once the capital of Japan, and while that title has moved to Tokyo, Kyoto still remains the cultural center of the nation. 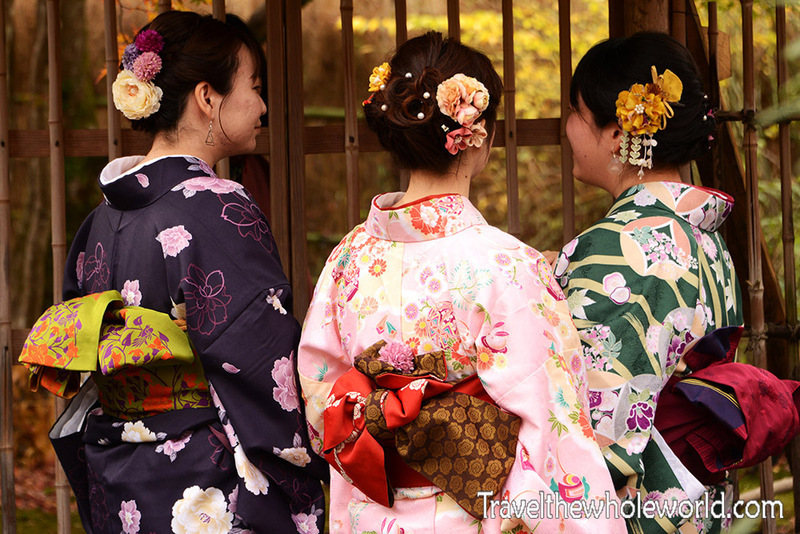 Something that is unique to Kyoto is that it’s the only city in Japan that still has okiyas and Geishas. Geishas are classy women who are extensively trained in performing arts, culture, and often seen with Japanese socialites. 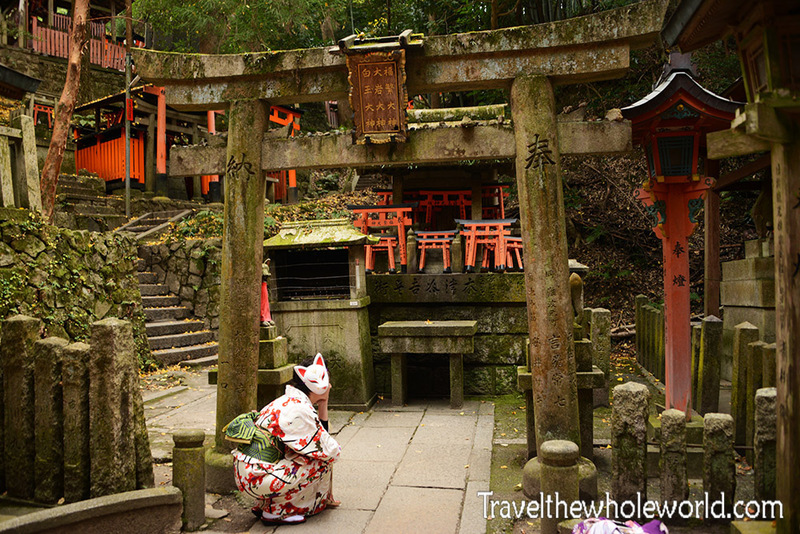 Okiyas are where Geishas are trained, and Kyoto has the only remaining okiyas in the country. 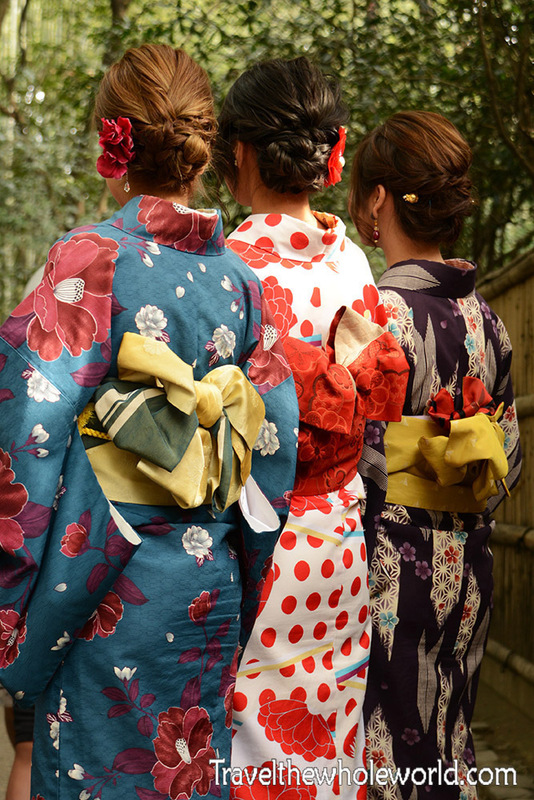 The vast majority of Geishas that you’ll see in Kyoto are not true Geishas, but just ordinary Japanese women who are dressing up for a fun day out like these three women above. I’ll get this out of the way first. 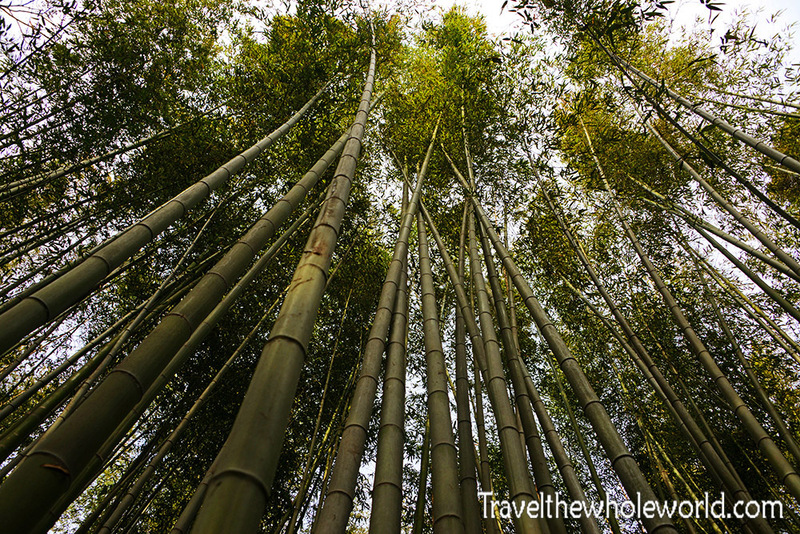 One of my first motivations to go to Kyoto was to see the Arashiyama bamboo forest. I hate to admit it, but what a disappointment! There are some magical looking photos of this place that I had seen for years before I was able to visit. 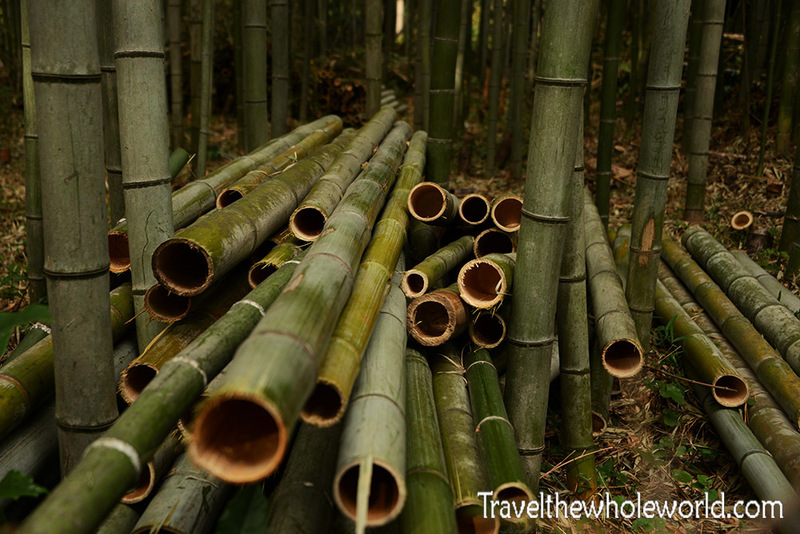 The photos were enough to convince me that if I could have only gone to one place in Kyoto, it would have certainly been Arashiyama. The place was a bit disappointing mainly because it was so crowded, even to the point where it was difficult to walk. The only photos I could really take without the back of someone’s head in my picture was those pointing straight up, or this one below in an area that off limits to people. 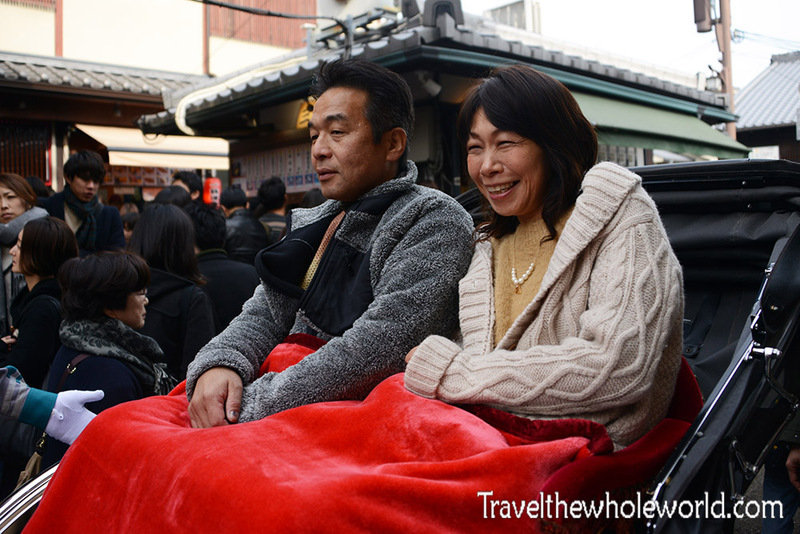 The only activity that looked like it may have been fun in Arashiyama was riding a bicycle pulled carriage around. I photographed this couple just outside the bamboo forest, but once inside it seemed like the carriages had their own private trails. I didn’t do it myself, but it looks like you definitely get to avoid the crowds and was probably more enjoyable than what I did! The only benefit to the crowds in Arashiyama was that some of these were Geishas, who often were posing among some beautiful backdrops. 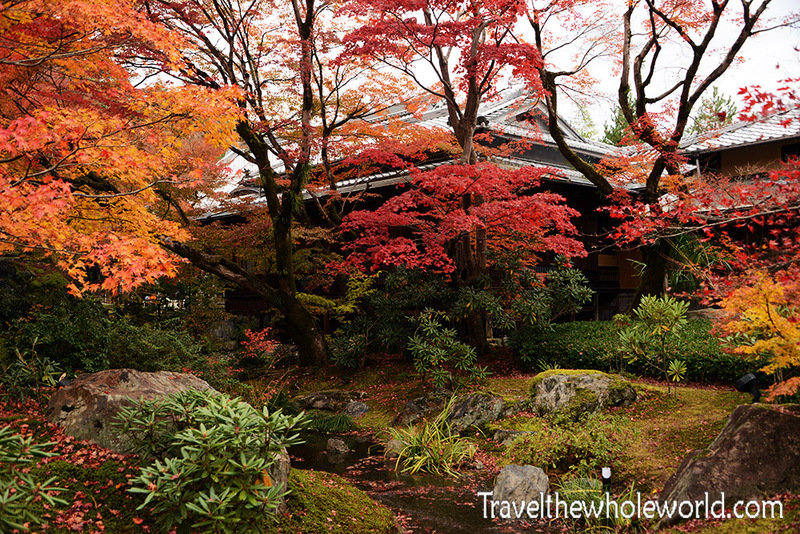 A much better place to visit than the bamboo forests in my opinion is Hogonin temple. This Buddhist temple has its shares of visitors, but did not seem to be annoyingly crowded unlike the bamboo forest. 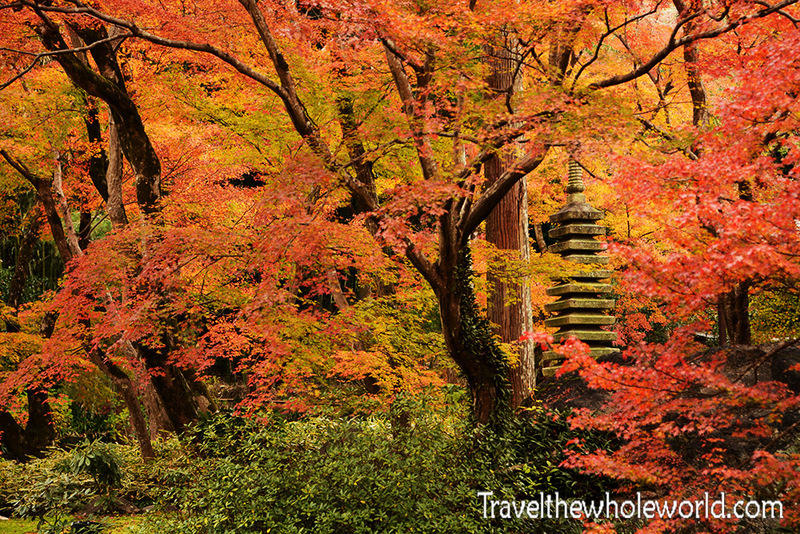 The best time to visit is likely in the fall time, as you can see the leaves were in their peak colors! The temple had lots of traditional architecture, even some of the ancient style roofs that were still built with mud and straw. I realized that the fall colors kind of got my attention so I didn’t focus as much on the actual temples. In the background of the photo above you can see one of the Japanese style pagodas, and of course, more geishas. 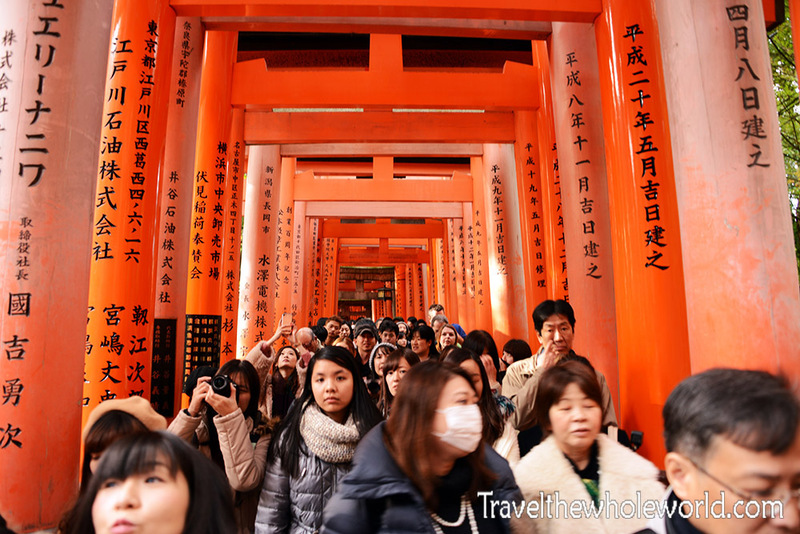 Even more crowded than Arashiyama forest is the Fushimi Inari-Taisha temple. As you can see it’s nearly impossible to stop here without you causing a traffic jam. Despite all the people here this temple was still one of my favorites. 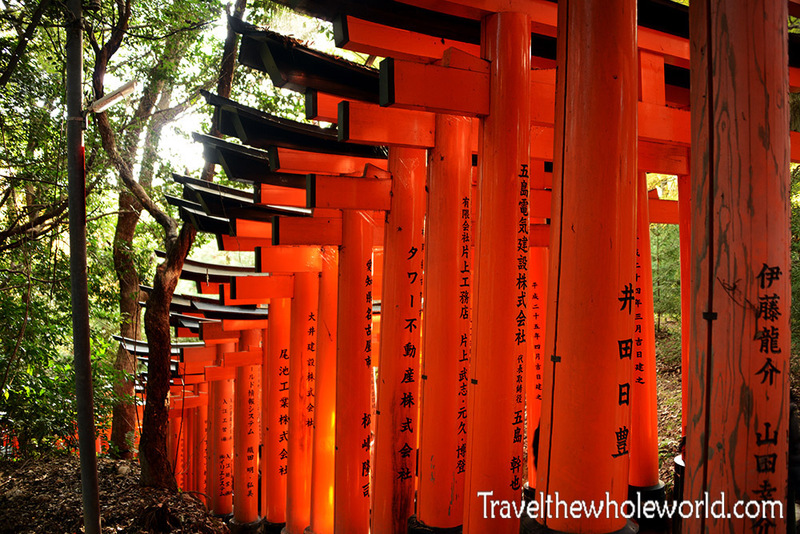 Fushimi Inari-Taisha is made up of tens of thousands of Japanese Torii gates, creating a unique and beautiful experience. 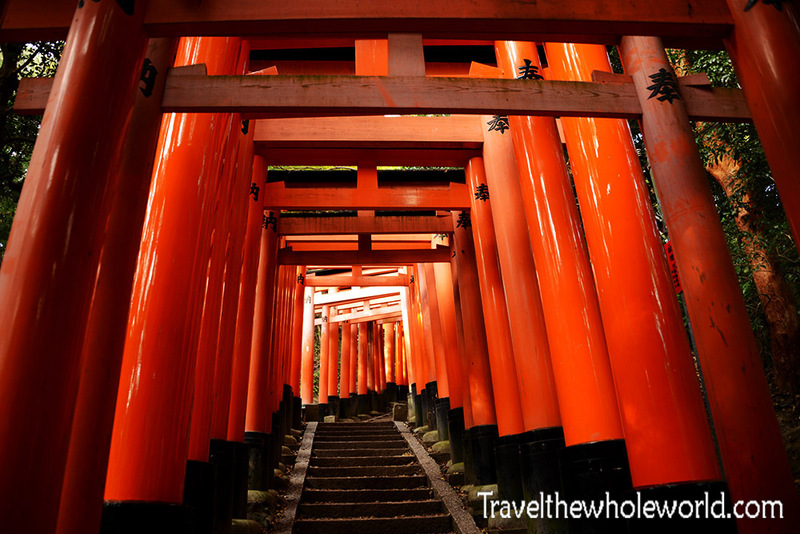 The great thing about Fushimi Inari-Taisha is that the temple is so massive you can seriously hike for hours here. The most crowded parts are obviously those by the entrance, but the higher you climb and further you get away from the main entrance, the more solitude you’ll find. The toriis are sacred gates belonging to the Japanese Shinto religion, and passing through them symbolizes a cleansing of the soul. Because there are so many visitors, the initial parts of the temple direct people in one way traffic. 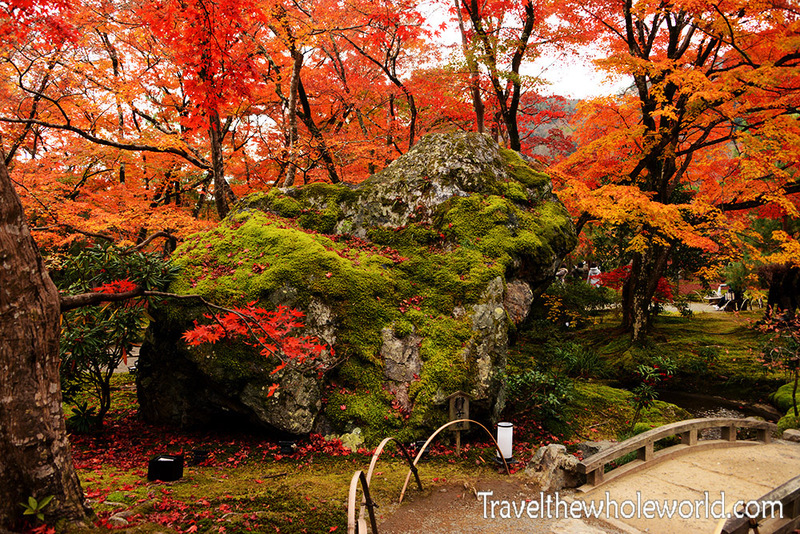 These toriis are at a higher location within the temple, and by this point you nearly have the place to yourself. 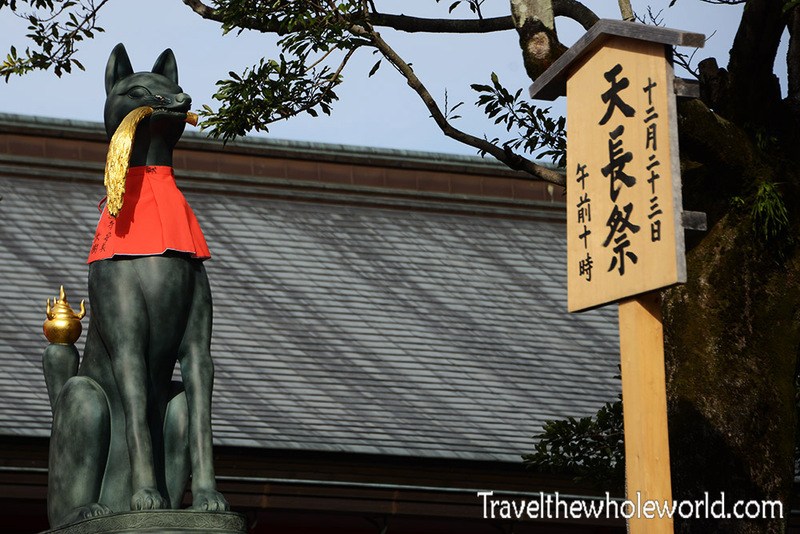 If you visit Fushimi Inari-Taisha, you’ll likely notice statues of foxes scattered in the temple grounds. 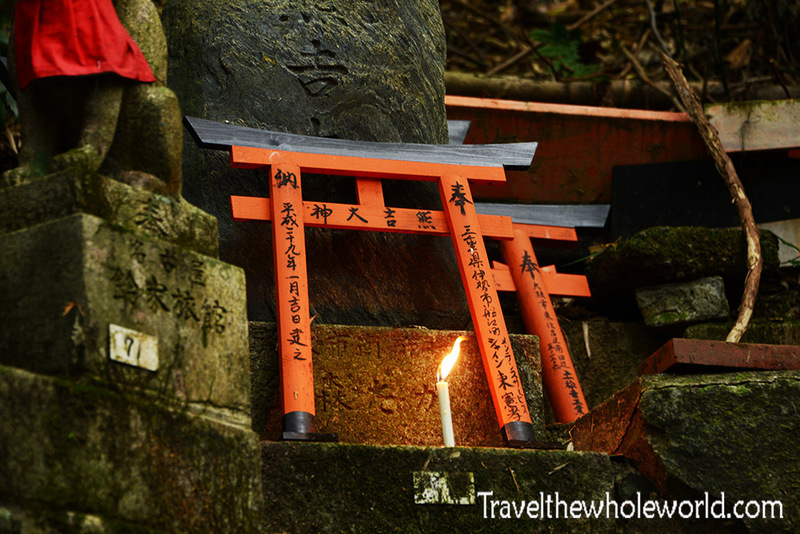 Foxes are symbolic as messengers and can be found in all Inari shrines throughout Japan. The foxes are often carrying items, such as a key in the example above. In the photo below, I even caught a Geisha wearing a fox mask. The temple is so massive and diverse that it’s one of the few places I think going unguided might be a mistake! 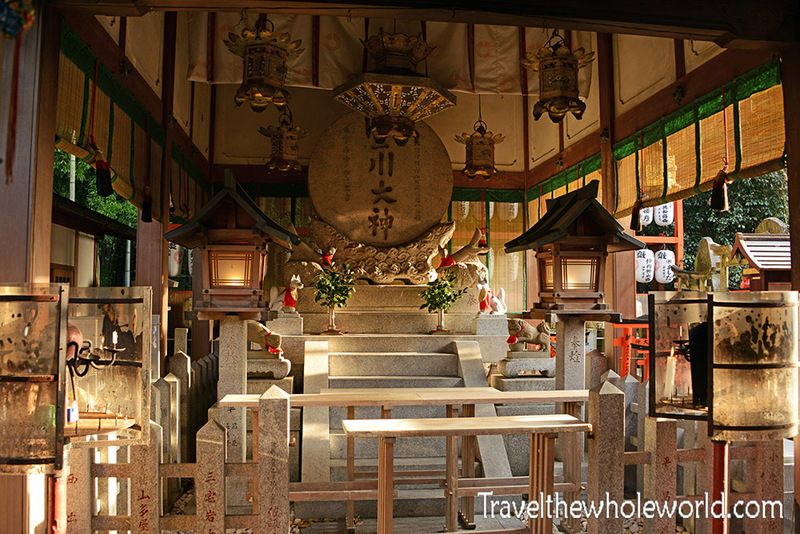 For example I’ve no idea what this beautiful shrine is that I found along the way. I do know that there are many graves in the temple. This one above had a freshly lit candle on it, while below you can see another grave has a Buddhist statue. 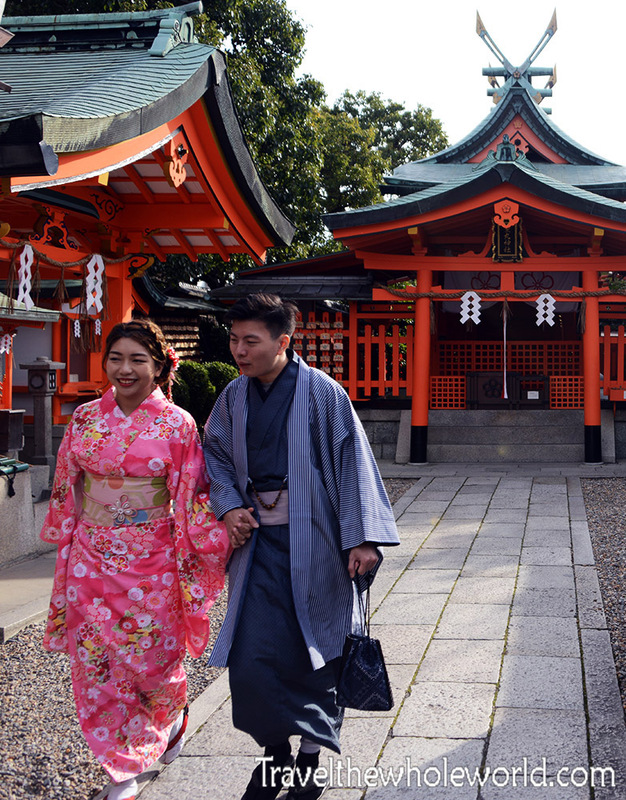 Although the Shinto religion is native to Japan, many Japanese embrace both culturally. I had studied Japanese in the past, and we learned that the Shinto religion kind of guides Japanese through life, while Buddhist focuses on the afterlife. There’s so many cultural places to visit in Kyoto, that I realized I didn’t really photograph the actual city! One exception might be the Kyoto Tower. In the midst of all these ancient temples, you won’t be able to miss the radio tower which rises 430 feet (131 meters) above the city. 400 feet actually isn’t impressive at all when it comes to skyscrapers, but in Kyoto that’s enough to make it the city’s tallest building. 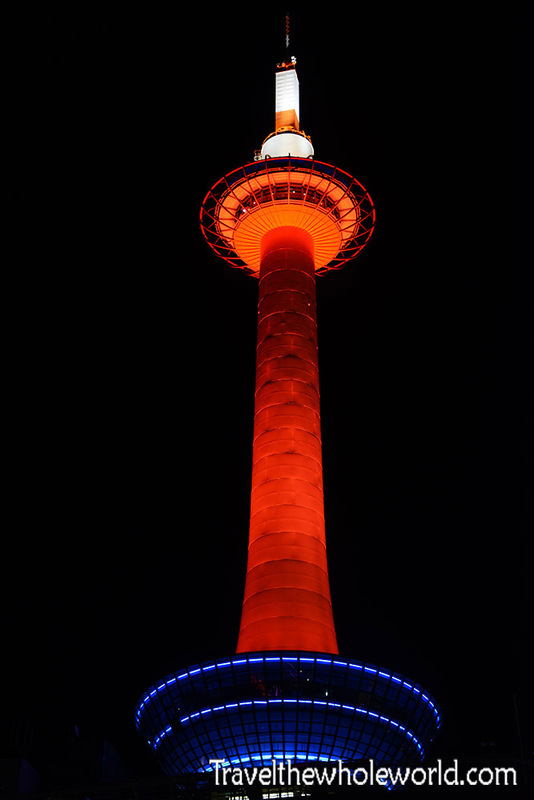 It seems that locals have a love and hate relationship with the Kyoto Tower; some feel it’s an eye sore in Japan’s ancient capital, while others welcome its modern presence. I suppose I hadn’t really thought anything of the tower in controversial terms, it’s been here long before I was born so to me it was always part of the city. The one thing I wish I had done was go up to the observation deck where you can get a great city view. Never enough time to do everything though! There are seriously dozens of important shrines and temples in Kyoto, but one last that I’ll share is the Kiyomizu Dera temple. The original temple here was founded in the late 700’s, but the current structures you see were build in the 17th century. Several buildings make up the complex here, but probably the most famous is the pagoda seen above. An interesting story with the temple, there is a giant dramatic balcony here that I failed to photograph that hangs over some 43 feet (13 meters). Long ago, it was said that if you jumped off the balcony and survived you’d get a wish granted. Well over 200 jumps were recorded, with a survival rate of about 85%! 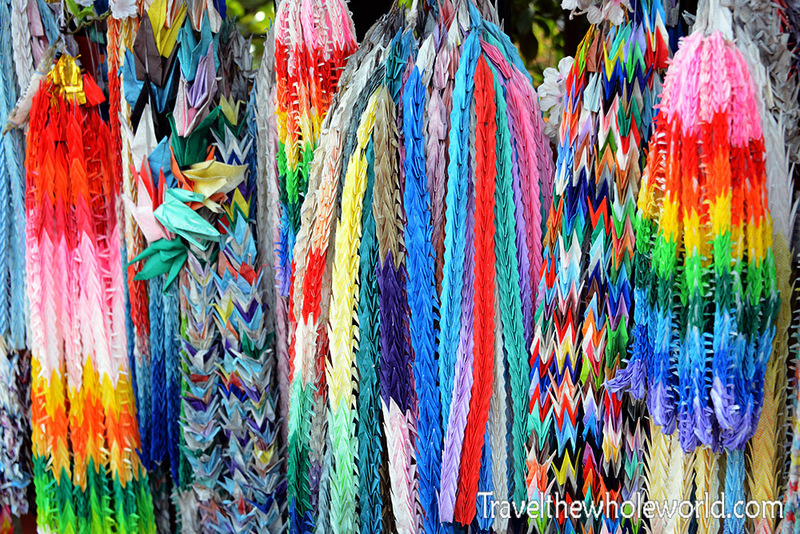 This practice of course is now banned, and people find ways to get good luck and wishes granted in other ways. Kiyo means clean or pure, and mizo in Japanese means water, so this temple is literally translated as the pure water temple. The name comes from a natural waterfall that the temple was built around. 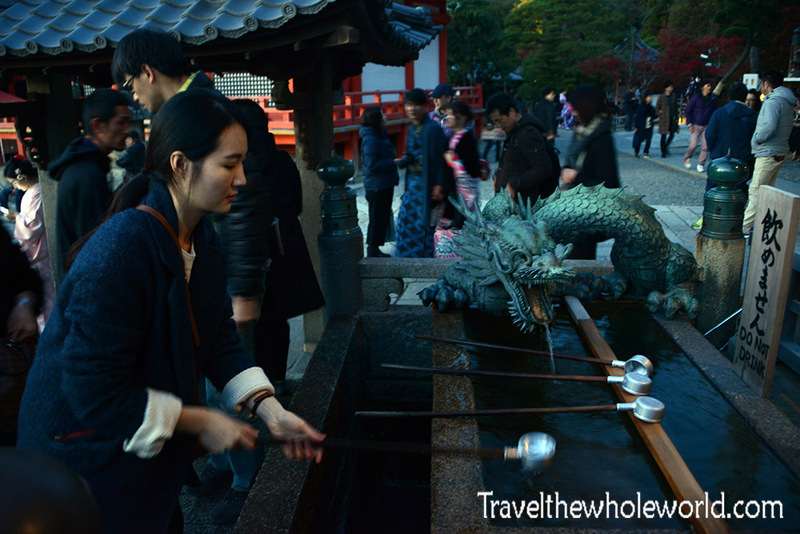 The photo above shows what I believe is a wishing well in the heart of Kiyomizu Dera. 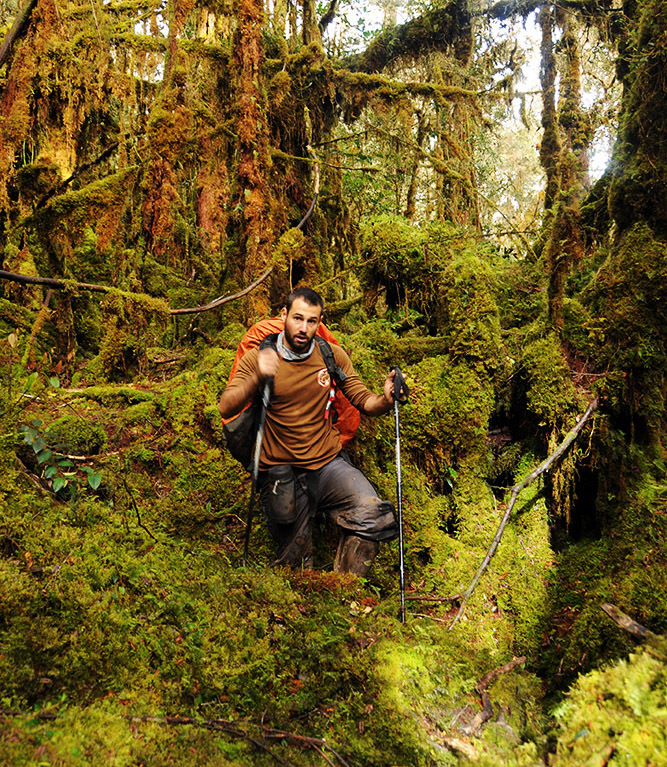 After I left the Dera Temple, I ended up hiking higher along a small trail instead of following the crowded entrance. 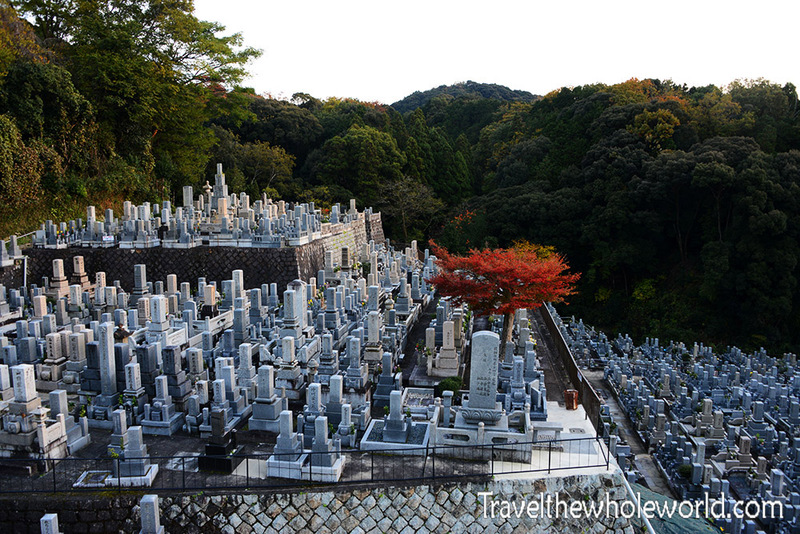 I had no idea this place even existed, but I immediately came across one of the largest cemeteries I have ever seen. 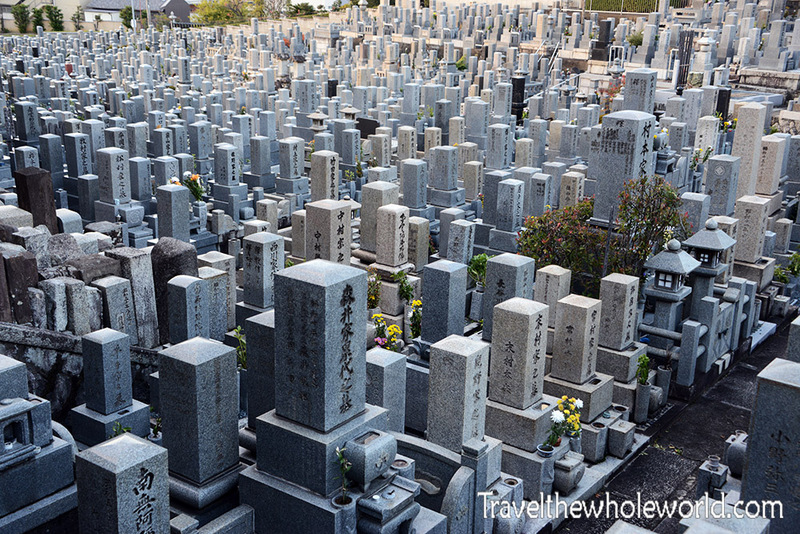 This is the Nishi Otani Buddhist cemetery, and has over 15,000 tombstones. 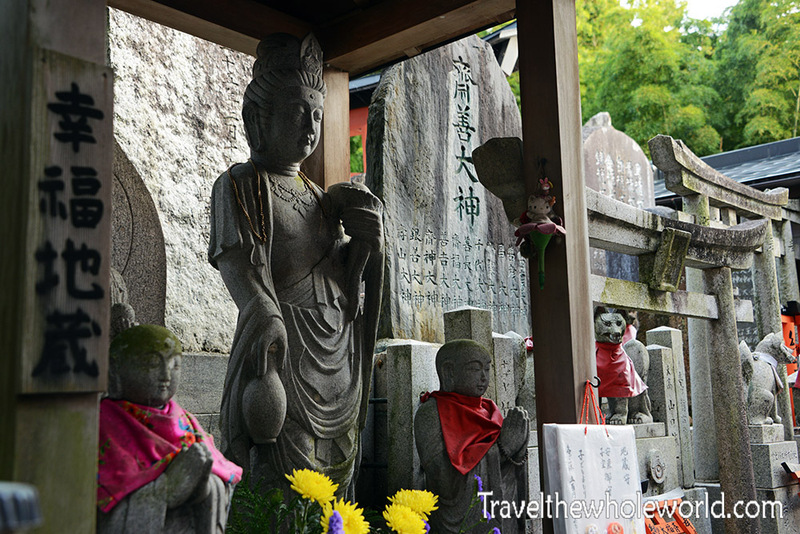 There wasn’t much information I could find out about this place, but my understanding is the religious leader Jōdo Shinshū is buried here, who was known as founding the current sect of Buddhism that is practiced by the majority in Japan. At the time I wasn’t aware of this, otherwise I would have definitely tried to to find his tomb. When night time came, I left the cemetery and returned to Kiyomizu Dera, then began heading back to central Kyoto on a crowded street. Here you’ll find lots of shops and restaurants, as well as plenty of street food for sale. Despite all the people in the streets, I found that most of the restaurants themselves weren’t actually crowded once you were inside. 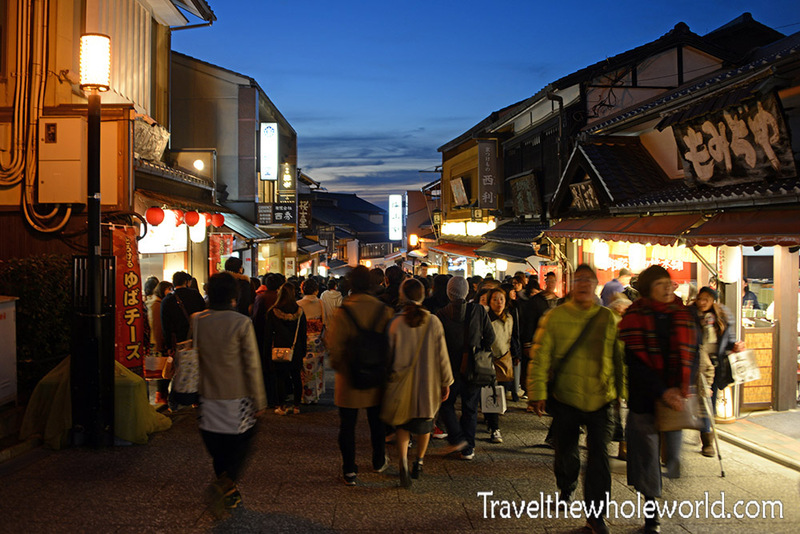 This area is probably one of the best places of Japan to get souvenirs and local food. 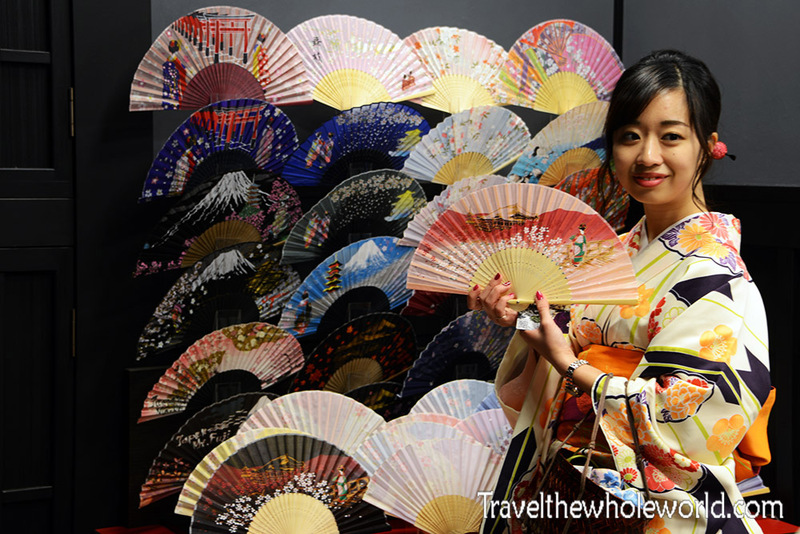 There were dozens of places selling these traditional fans, geisha costumes, and Japanese pottery. I actually bought a few small tea cups and beautiful plates that were fairly priced. By reasonable priced I mean around $10 or so. 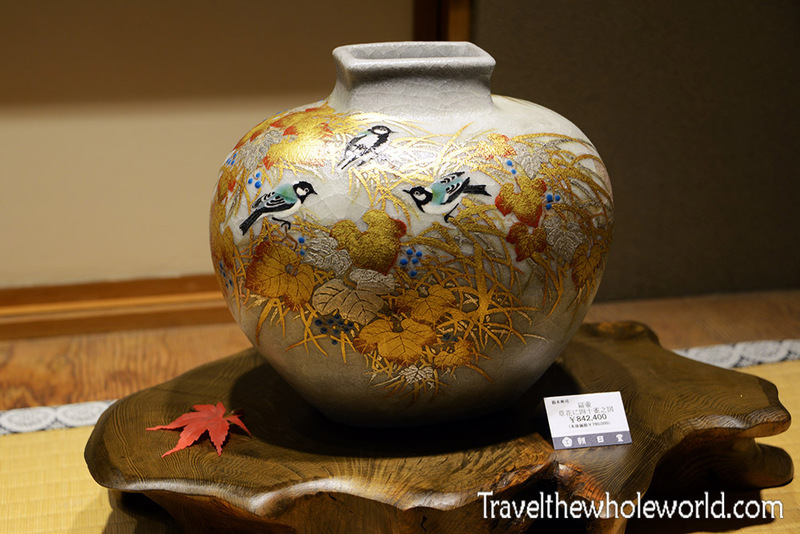 This pottery piece below cost a ridiculous $8,000!